Move over, hyenas and saber-toothed cats; there's a mammal with an even stronger bite. 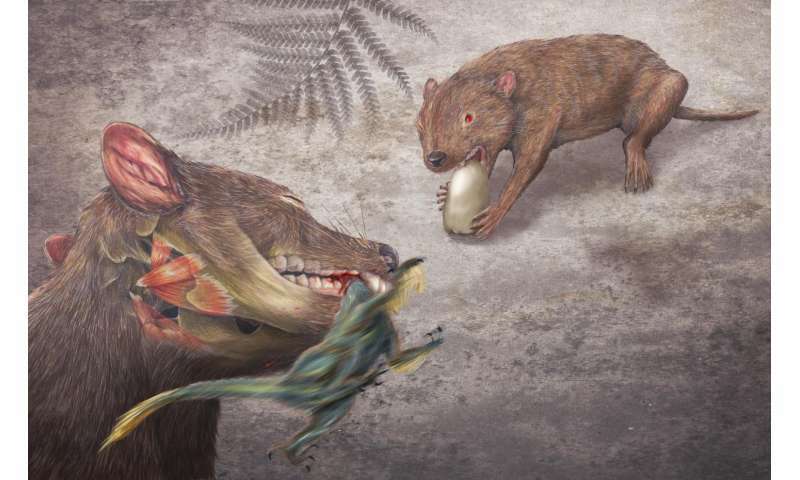 A new study by Burke Museum and University of Washington paleontologists describes an early marsupial relative called Didelphodon vorax that lived alongside ferocious dinosaurs and had, pound-for-pound, the strongest bite force of any mammal ever recorded. Published in the journal Nature Communications, the team's findings suggest mammals were more varied during the Age of Dinosaurs than previously believed. Didelphodon was able to eat a variety of foods, and was likely a scavenger-predator who could eat prey ranging from snails to small dinosaurs. 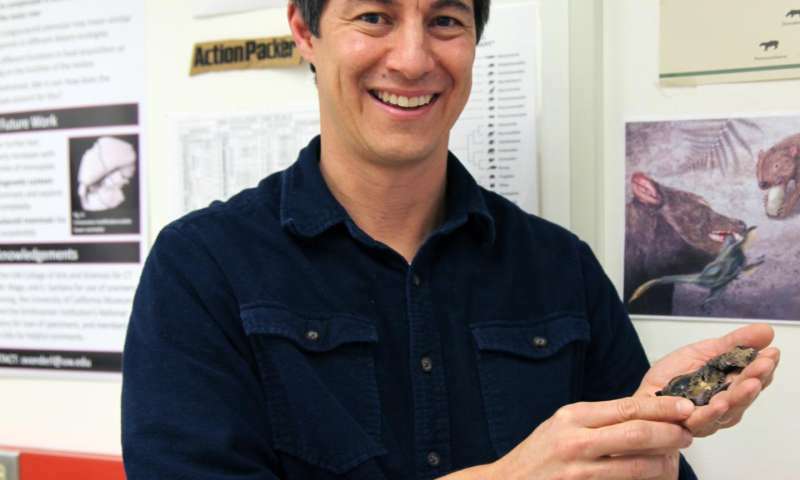 "What I love about Didelphodon vorax is that it crushes the classic mold of Mesozoic mammals," Dr. Gregory P. Wilson, Burke Museum Adjunct Curator of Vertebrate Paleontology and University of Washington Associate Professor of Biology, said. "Instead of a shrew-like mammal meekly scurrying into the shadows of dinosaurs, this badger-sized mammal would've been a fearsome predator on the Late Cretaceous landscape—even for some dinosaurs." All of these findings are made possible by four fossil specimens recently discovered in the 69-66 million-year-old deposits of the Hell Creek Formation in Montana and North Dakota. Prior to these discoveries, the 60 known species of metatherians (marsupials and their closest relatives) from the Cretaceous of North America—including Didelphodon—were almost all identified through fragments of jaw bones or teeth, providing a limited glimpse into marsupials' closest relatives. 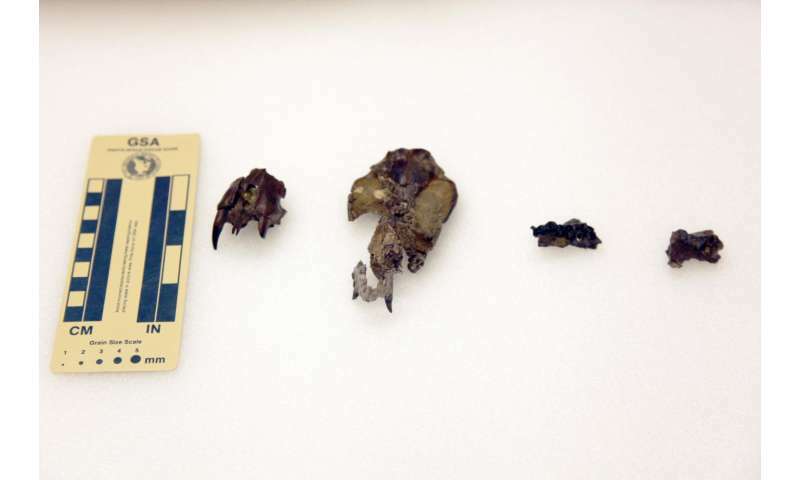 These four fossils include a nearly-complete skull from the North Dakota Geological Survey State Fossil collection, a partial snout and an upper jaw bone from the Burke Museum's collections, and another upper jaw from the Sierra College Natural History Museum. By analyzing never-before-seen parts of Didelphodon's anatomy, Dr. Wilson and his colleagues were able to determine these marsupial relatives were about the size of today's Virginia opossum and were the largest metatherian from the Cretaceous. With a nearly complete skull to measure, they were able to estimate the overall size of Didelphodon, which ranged from 5.3-11.5 pounds. To test the bite force of Didelphodon, Abby Vander Linden, a UW Biology research technician in Burke Museum Curator of Mammalogy Dr. Sharlene Santana's lab and now a graduate student at University of Massachusetts Amherst, CT-scanned the fossils and compared the gaps in reconstructed skulls where jaw muscles would go to present-day mammals with known bite forces. Bite force measurements indicate that pound-for-pound, Didelphodon had the strongest bite force of any mammal that has ever lived. In addition to the bite force, Didelphodon's canines were similar to living felines and hyenas—suggesting they could handle biting into bone, biting deep and killing prey. Its shearing molars and big rounded premolars, combined with powerful jaws and jaw muscles indicate it had a specific niche in the food web as a predator or scavenger capable of crushing hard bone or shells, and was capable of eating prey as big as it was—even possibly small dinosaurs. "I expected Didelphodon to have a fairly powerful bite based on the robust skull and teeth, but even I was surprised when we performed the calculations and found that, when adjusted for body size, it was capable of a stronger pound-for-pound bite than a hyena," Vander Linden said. "That's a seriously tough mammal." Co-author Dr. Jonathan Calede, former UW Biology graduate student and now a visiting assistant professor at Bucknell University, also examined "microwear" patterns, or tiny pits and scratches on the specimens' teeth, to indicate what the animals were eating as their "last suppers" (most likely one-to-two days before the animals died). By comparing the microwear patterns from Didelphodon to the teeth of other fossilized species and current-day mammals with known diets from the Burke's mammal collection, Calede found Didelphodon was an omnivore that likely consumed a range of vertebrates, plants and hard-shelled invertebrates like molluscs and crayfish, but few insects, spiders and annelids (earthworms and leeches). "The interesting thing about these fossils is that they allowed us to study the ecology of Didelphodon from many angles," Calede said. "The strength of the conclusions come from the convergence of microwear with bite force analysis, studies of the shape and breakage of the teeth, as well as the shape of the skull as a whole." In addition to learning much more about the biology of Didelphodon, the newly-described skull features on these fossils provide clues that help clarify the origin of all marsupials. The team found five major lineages of marsupial ancestors and marsupials themselves diverged in North America 100-85 million years ago. Marsupial relatives also got larger and ate a wider variety of foods, coinciding with an increase in diversity of other early mammals and flowering plants. Most of this North American diversity was then lost gradually from the late Campanian to Maastrichtian (79-66 million-years-ago) and then abruptly during the Cretaceous-Palaeogene (66 million-years-ago) mass extinction that also killed all dinosaurs except birds. Around this time, marsupials' diversity and evolution shifted to South America. "Our study highlights how, despite decades of paleontology research, new fossil discoveries and new ways of analyzing those fossils can still fundamentally impact how we view something as central to us as the evolution of our own clade, mammals," Dr. Wilson said. This specimen was reconstructed and mounted by Ray Vodden a number of years ago. Custom mounted cast replicas are available from Dinosaur Brokers for $6750. The original mounted specimen is in the collections at the Houston Museum of Natural Science. It is an amazing little critter!